Have you ever wished you had an easy way to count money? Well, there’s an app for that. 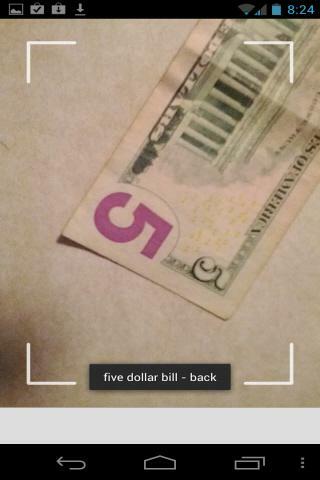 IDEAL Currency Identifier is a free Android app that scans U.S. currency and states the number on the bill. It has been recommended for blind and visually impaired shoppers. The app was created by IDEAL Group and the Android Team, as well as the National Institute on Disability and Rehabilitation Center within the U.S. Department of Education, the Wireless Rehabilitation Engineering Research Center, the Appfactory, the Bureau of Engraving and Printing within the U.S. Department of Treasury. Place the bill on a flat surface under good light before you use the app. Keep in mind you also need to have a text-to-speech voice feature installed on your smart phone for the app to work. Then open the app (keep in mind the app may take 30 to 45 seconds to load). Hold the phone over the bill as though you were taking a photograph of it with your smart phone. The app will state the denomination of the bill. The app, which is free, can read U.S. currency dating back to 1993. However, wrinkles on the bill and lighting conditions can slow the identification process for the app. In some cases, it may not be identified or may be misidentified. IDEAL has had luck in the Google Play store. The app has received between 1,000 and 5,000 downloads, according to the Google Play website. It has a 5-star rating from 22 people, and a number of reviews lauding its accuracy. One user wrote that the app works much better than Looktel, even in bad light. The identifier is compatible with Android 4X devices with rear-facing cameras. No Internet connection is required to identify the bills. Want to learn more about IDEAL Currency Identifier? The video below demonstrates how to use the app. Post written by Steph Solis, MABVI blog manager and development intern. In honor of White Cane Safety Day, we are taking a look at white canes and if they can benefit you. Bianca Rossetti, Director of Orientation and Mobility Services at MAB Community Services, breaks it down. What is a white cane? Who can use a white cane? Anyone with a visual impairment significant enough that traveling without a cane is hazardous. Some individuals use a cane in all environments, some only use a cane in outdoor environments and/or at night. How is a white cane actually used to travel? There are different cane techniques used to accomplish tasks such as going up or down stairs, navigating escalators, finding and traversing doorways, helping to find dropped objects, locating and clearing curbs, etc. 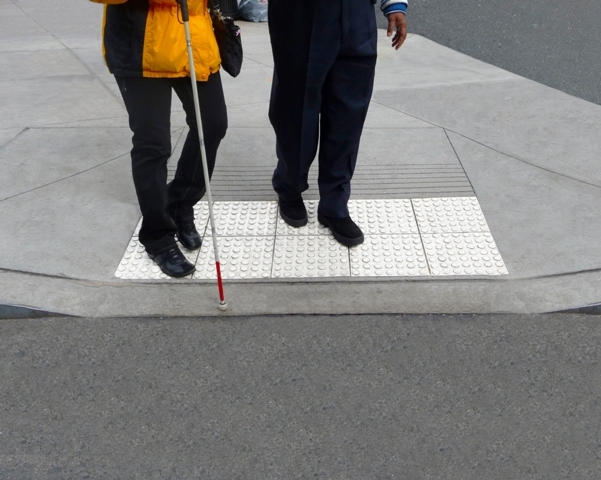 The technique described below allows individuals with visual impairment to walk confidently down a hall or sidewalk. To start, the person holds the cane handle at waist level using his dominant hand. He holds the cane with his hand wrapped around the handle and his index finger pointing down along the cane handle. The cane tip rests on the ground. While walking, the cane is swept from side to side in an arch that extends approximately 1” outside of the widest part of his body. As he walks, the cane touches the ground at the end of each sweep from right to left. It is done in such a sequence that the cane taps the spot where the next footstep will land. This allows the person to clear the area of each step before his foot lands on the spot. If there is a hole, the cane finds it first. If there is an object lying on the floor, the cane encounters it and prevents a stumble or fall. Some people even use the sound of the cane tapping on the surface to give them cues about the size of the area in which they are walking and on which type of surface they are walking. Will one cane fit all? The answer is a resounding no! The cane should be long enough so that it comes up to your armpit when the tip is resting on the floor. This will allow the tip to land on the proper spot as described in the above technique. Some experienced cane users like to have a cane that is somewhat longer than described, but measuring from your armpit is the general guideline. What does a basic cane look like? White canes come in two basic types, the straight cane and the folding cane. The straight cane is made of a long tube of aluminum or fiberglass with a handle on one end and a ceramic, nylon, or metal tip on the other. The handle may have a wrist loop on the end or a small crook, which can be used to store the cane when not in use. The body of the cane is covered with a white paint or white reflective tape to provide visibility. Some canes have a few inches of red at the tip, although this is not mandatory. The folding cane looks similar to a straight cane except that it is broken up in to several sections held together by an elastic chord running through the middle of the tubing, which allows the cane to be held tightly together when unfolded, or folded when not in use. What is a white cane usually made of? The cane is usually made of fiberglass or aluminum, although other lightweight materials such as graphite are now being used as well. Because a cane is being swept back and forth continually and used in other active ways to detect obstacles in the environment, it is important that the cane is made of light, but durable material to prevent fatigue to the user and tolerate ware and tare during travel. Are there different kinds of tips for canes? The basic purpose of a tip is to protect the end of the cane shaft as the cane is being tapped or slid across the traveler’s path. There are several different types of cane tips to choose from based on preference. There is the pencil tip, marshmallow tip, marshmallow roller tip, jumbo roller tip, and roller ball tip. How long will a white cane last? The answer to this question depends on many factors. If a cane is used primarily inside a building, it may last for years. If it is used outside to travel from place to place, it will probably not last as long. A straight cane usually last much longer than a folding cane because the elastic of the folding cane breaks down from regular use. Watch a video demonstration of using a white cane! Information modified from the resource: “White Cane Basics” by Jerry Howell and retrieved at Howell Mobility website. 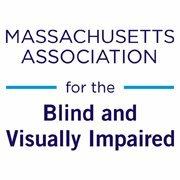 Use the following sites to learn more about White Canes or to order a white cane: Ambutech, LS&S, National Federation of the Blind and The Carroll Center for the Blind. Bianca Rossetti, M.Ed., COMS, is the Director of Orientation and Mobility Services for MAB Community Services. For questions or comments, she can be reached at brossetti@mabcommunity.org or at 617-930-0172. 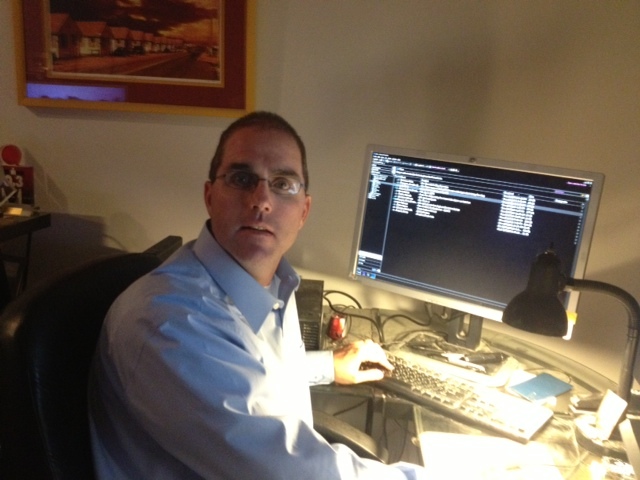 Erich Manser is seen using the ZoomText on his desktop computer. He uses ZoomReader magnifier on his mobile device. For this, I wanted to take some time to dig-in a bit to Ai Squared’s ZoomReader application for iOS devices, which I personally use on my iPhone 4S. Full disclosure, Ai Squared is a sponsor of mine (www.erichmanser.com) and I’m proud to represent a company focused on making technology accessible for the visually-impaired out on the race course. Nonetheless, my primary goal is to provide an objective review that includes candid, honest feedback on what I consider to be strengths or weaknesses from my experience using the application. 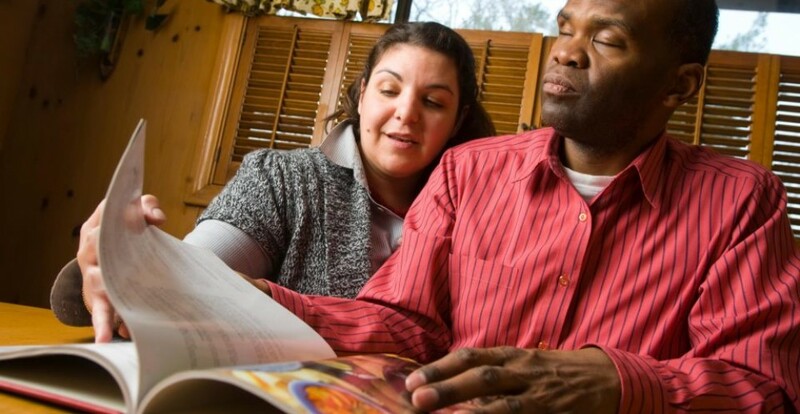 As a low-vision user, I do a fair amount of research online prior to purchasing any new assistive technology and I know how much I rely on the shared experiences and opinions of others in that search. I would be doing this community a disservice if I lost objectivity. What is ZoomReader by Ai Squared? ZoomReader is a mobile application for iOS devices. This app, in conjunction with the device’s built-in camera, allows users to take a picture of any object containing text. The app itself can be customized in appearance and performance to make features more accessible to users. ZoomReader offers increased independence for users in activities such as going grocery shopping and reading prescription bottles. ZoomReader can be used with iPhone 4, 4S, 5, iPad (with retina display), iPad mini and iPod Touch (5th generation). First off, I love that ZoomReader even exists, and that Ai Squared put the time, thought and resources in to developing this mobile application specifically designed to make daily life easier for visually-impaired people. Apps like ZoomReader expand upon the wonderful innovations that Apple made in smartphone accessibility, making these phones equally indispensable to visually-impaired as well as sighted users – leveling the playing field. Another thing I love is that I can use ZoomReader’s slide-zoom feature as a “quick reference” magnifier on the fly. Inside the app, the slide-zoom is located on the far left of your screen, from top to bottom. It features a slide button which the user can point and drag up, producing the greatest magnification, or down. Because I normally use my iPhone’s accessible reverse contrast (white-on-black) feature, using the slide-zoom in tandem with this allows for a quick and easy way to reference business cards, printed addresses, phone numbers or other small bits of information on the go. In general, I really like the functionality of the application. They have adopted a “simple is better” philosophy, which I personally feel improves accessibility in general. The layout and operation of the app is clean and intuitive. As a low-vision user, I was able to explore the various features with relative ease. When you open the app, there are simply five buttons, beyond the slide-zoom mentioned above. The additional buttons allow the user to snap the pictures, control lighting when taking pictures, adjust text-sizes or coloring, access personal photos stored on the device and tweak other settings. Options within the other settings include “Voice Recognition,” which allows the user to take a picture by simply saying “Click” or “Take Picture”, and “Automatic Speech after OCR” which enables the app to immediately begin reading the text once it’s been captured. You can also control the rate-of-speech, though faster begins to sound like “The Alvin and the Chipmunks” cartoon. The pleasant, default male voice is “Tom”, but there are options to purchase other voices. Finally there is a link for help and support if needed. The biggest challenge I have had in learning and using ZoomReader has been in capturing “clean images.” This is a requirement in order for the text to be accurately read back. The instructions for image-capture suggest placing your object on a flat surface with ample lighting and snapping the picture with a steady hand from about 12-inches away. An available feature can announce whether your object is in landscape or portrait orientation. Variability in any of these elements can result in all or part of the image being garbled, and the audio readout being gibberish. Ai Squared does sell 12-inch stands to increase stability and minimize these instances, though I have come up with a little trick that seems to help as well. Noticing that my forearms are each about a foot long, I rest my elbows on the table holding the iPhone across the top, creating a sort of stabilized “stand.” Placing the object-to-be-photographed between my elbows, I aim the camera down to capture the image. This has greatly improved my success for capturing clean, usable images. I can honestly say I have been a happy ZoomReader user for just about a year. As a low-vision user who has not been able to optimize a full-featured smartphone until pretty recently, ZoomReader has truly enhanced this relatively new experience for me. The app is simple, straight-forward and easy to navigate. It isn’t “ZoomText for your smartphone”, but it’s also not intended to be. It is what it is, and it’s great at what it does – making daily life easier for visually-impaired users. This post was written by Erich Manser. Erich is a longtime supporter of MABVI and a runner on Team With A Vision for the Boston Marathon. Click here to see his interview with Dorothy Krysiuk of WCVB Channel 5 Boston about his training process for the race.